“Wow,” I finally say, because although there are few rules to this group, the ones we have are steadfast: be a good listener, don’t judge, and don’t put boundaries on someone else’s grief. I know this better than anyone. After all, I’ve been coming for nearly three years now. “What did you bring?” Mrs. Dombrowksi asks, and I realize why she’s toting her husband’s urn. At our last meeting, our facilitator—Marge—had suggested that we share a memory of whatever it was we had lost. I see that Shayla is clutching a pair of knit pink booties so tightly her knuckles are white. Ethel is holding a television remote control. Stuart has—again—brought in the bronze death mask of his first wife’s face. It has made an appearance a few times at our group, and it was the creepiest thing I’d ever seen—until now, when Mrs. Dombrowski has brought along Herb. “So that makes it an inviolable truth?” Jocelyn rolls her eyes. Like me, she is in her twenties. Unlike me, she has no patience for anyone over the age of forty. “News flash: you’re already dead when you’re put into the fire,” Jocelyn says, and Mrs. Dombrowski bursts into tears. Six months later, Mary opened Our Daily Bread at the foothills of the Our Lady of Mercy Shrine in Westerbrook, New Hampshire. The shrine covers sixteen acres with a meditation grotto, a peace angel, Stations of the Cross, and holy stairs. There is also a store filled with crosses, crucifixes, books on Catholicism and theology, Christian music CDs, saints’ medals, and Fontanini creche sets. But visitors usually come to see the 750-foot rosary made of New Hampshire granite boulders, linked together with chains. Mary says it’s divine intervention that she ran into me. (She calls herself a recovering nun, but in reality, she gave up her habit, not her faith.) Me, I don’t believe in God; I think it was pure luck that the first classifieds section I read after Marge made her suggestion included an ad for a master baker—one who would work nights, alone, and leave when customers began to trickle into the store. At the interview Mary didn’t comment on the fact that I had no experience, no significant summer jobs, no references. But most important, she took one look at my scar and said, “I’m guessing when you want to tell me about that, you will.” And that was that. Later, as I got to know her, I’d realize that when she gardens, she never sees the seed. She is already picturing the plant it will become. I imagine she thought the same, meeting me. “That Yoko Ono is going to sue you for copyright infringement,” I reply. She hits the ground with a soft thud. “No, we had the preschool drop-off rush and a good lunch.” Getting to her feet, she wipes her hands on her jeans and follows me into the kitchen. “By the way, Satan called,” she says. “Have fun,” I say, tying the strings of my apron, and focusing on the night’s work. Grief group is like AA—you don’t “out” someone unless you have his permission. “We’ve met,” I reply, shaking my hair forward to screen my face. I don’t know what makes me say what I say. After all, I have plenty to do. But it has started to pour now, a torrential sheet of rain. The only vehicles in the lot are Mary’s Harley and Rocco’s Prius, which means Mr. Weber is either walking home or waiting for the bus. “You can stay until Advanced Transit shows up,” I tell him. “Okay,” Mary says, pausing in the middle of pulling on her chaps. “I don’t do customers.” In fact when I stumble out of the bakery at 7:00 a.m. and see the shop filled with businessmen buying bagels and housewives slipping wheat loaves into their recycled grocery bags, I am always a little surprised to remember there is a world outside my industrial kitchen. I imagine it’s the way a patient who’s flatlined must feel when he is shocked back into a heartbeat and thrown into the fuss and bustle of life—too much information and sensory overload. From the kitchen comes the sound of the timer buzzing; it wakes up Eva, who begins to bark. Almost simultaneously there is a sweep of approaching lights through the glass windows of the bakery as the Advanced Transit bus slows at its corner stop. “Thank you for letting me stay a bit,” he says. I watch him tuck Eva into his coat and open his umbrella. “Come back soon,” I say, because I know Mary would want me to. “Tomorrow,” he announces, as if we have set a date. As he walks out of the bakery he squints into the bright beams of the bus. “Your Great American Novel?” I guess. Ever since Mary installed free WiFi at Our Daily Bread, the place has been crawling with people who intend to be published. My sisters and I all knew my mother’s favorite song had been “Somewhere over the Rainbow.” Pepper and Saffron had wanted to hire a professional to sing it, but I had other plans. It wasn’t just the song my mother had loved, it was one particular rendition of it. And I’d promised my mother that Judy Garland would sing at her funeral. “I’ve seen worse,” Adam replied. “My mother would have thought it was funny,” I whispered. “There you go.” Adam handed me the CD in its sleeve. Adam grinned. “I bet your mom would have thought that was funny, too,” he said. “I think Shannon knows,” Adam says today, when I am lying in his arms. “Really?” I try to ignore how this makes me feel, as if I am at the top of the roller coaster hill, and I can no longer see the oncoming track. “Because I didn’t,” Adam says. “Let’s go away this weekend,” I suggest. “What if you’re paged?” I ask. “They’re not going to get any deader if they have to wait,” Adam points out. I have to say, the thing I adore most about Adam is exactly what’s keeping him from being with me all the time: that when he loves you, he loves you unerringly, completely, overwhelmingly. It’s how he feels about his twins, which is why he is home every night to hear how the biology test went for Grace or to see Bryan score the first home run of the baseball season. “Do you know Josef Weber?” I ask, suddenly remembering what Mary said. “What do you know about him?” I ask, turning on my side. “I’m sure you’ll think of something,” I say, and I wrap my arms around his neck. In a town the size of Westerbrook, which was derived of Yankee Mayflower stock, being Jewish made my sisters and me anomalies, as different from our classmates as if our skin happened to be bright blue. “Rounding out the bell curve,” my father used to say, when I asked him why we had to stop eating bread for a week roughly the same time everyone else in my school was bringing hard-boiled Easter eggs in their lunch boxes. I wasn’t picked on—to the contrary, when our elementary school teachers taught holiday alternatives to Christmas, I became a virtual celebrity, along with Julius, the only African-American kid in my school, whose grandmother celebrated Kwanzaa. 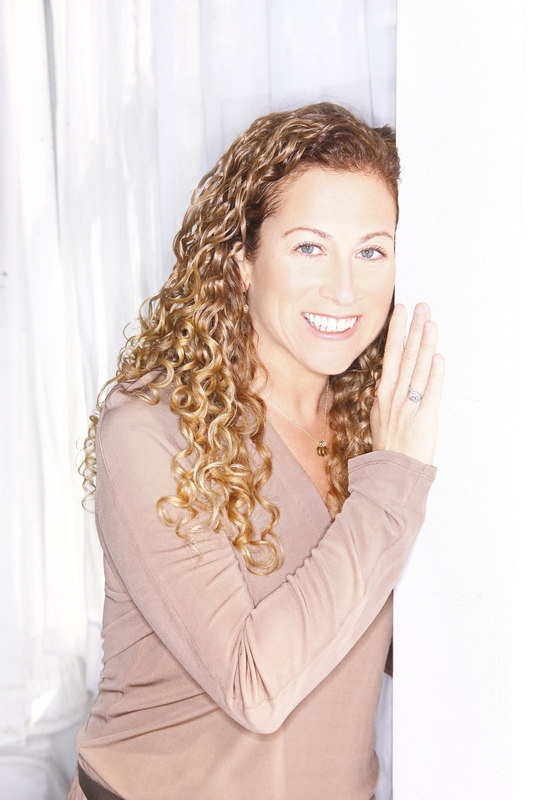 I went to Hebrew school because my sisters did, but when the time came to be bat mitzvahed, I begged to drop out. When I wasn’t allowed, I went on a hunger strike. It was enough that my family didn’t match other families; I had no desire to call attention to myself any more than I had to. My parents were Jews, but they didn’t keep kosher or go to services (except for the years prior to Pepper’s and Saffron’s bat mitzvahs, when it was mandatory. I used to sit at Friday night services listening to the cantor sing in Hebrew and wonder why Jewish music was full of minor chords. For Chosen People, the songwriters sure didn’t seem very happy). My parents did, however, fast on Yom Kippur and refused to have a Christmas tree. We had studied the Holocaust in social studies class. It was hard to imagine the textbook pictures of living skeletons matching the plump woman who always smelled like lilacs, who never missed her weekly hair appointment, who kept brightly colored canes in every room of her condo so that she always had easy access to one. She was not part of history. She was just my grandma. That was the one and only time we ever discussed Grandma Minka’s past, although when we brought her to our house for Chanukah that year, I found myself scrutinizing her to see some shadow of the truth on her face. But she was the same as always, picking the skin off the roasted chicken to eat when my mother wasn’t looking, emptying her purse of perfume and makeup samples she’d collected for my sisters, discussing the characters on All My Children as if they were friends she visited for coffee. If she had been in a concentration camp during World War II, she must have been a completely different person at the time. “Well,” I say. “Good afternoon to you, too.” Then I open the refrigerator and take out a tray of buns. “Here we go,” I mutter. She moves, blocking my path. “That doesn’t mean He doesn’t believe in you,” she says. My scar tingles. My left eye starts to tear, the way it did for months after the surgery. Back then it was as if I were sobbing for everything I would be losing in the future, even though I didn’t know it at the time. Maybe it is archaic and—ironically—biblical to believe that ugly is as ugly does, that a scar or a birthmark is the outward sign of an inner deficiency, but in my case, it also happens to be true. I did something awful; every time I catch a glance of my reflection I am reminded of it. Is it wrong for most women to sleep with a married man? Of course, but I am not most women. Maybe that’s why, even though the old me would never have fallen for Adam, the new me did just that. It’s not that I feel entitled, or that I deserve to be with someone else’s husband. It’s that I don’t believe I deserve anything better. I’m not a sociopath. I’m not proud of my relationship. But most of the time, I can make excuses for it. The fact that Mary has gotten under my skin today means that I am tired, or more vulnerable than I thought, or both. That poor woman is Adam’s wife. That poor woman has a man I love, and two wonderful kids, and a face that is smooth and scar-free. That poor woman has had everything she wants handed to her on a silver platter. I want to believe her. I want to believe her, so much. “Then I guess sometimes good people do bad things,” I say, and I pull away from her. In the bakery shop, I hear Josef Weber’s clipped accent, asking for me. I wipe my eyes on the hem of my apron and grab a loaf I’ve set aside and a small package; I leave Mary standing in the kitchen without me. “Hello!” I say brightly. Too brightly. Josef looks startled by my false good cheer. I thrust the small bag of homemade dog biscuits for Eva into his hands, as well as the loaf of bread. Rocco, who is not used to me fraternizing with the customers, pauses in the act of restacking clean mugs. “Wonders never cease / From the deepest, darkest bowels / The recluse arrives,” he says. “Who knew that even in the world of baking, there is a class structure?” Josef muses. my hair fall in front of it. But Josef, he is either too polite or too embarrassed to mention it. Or maybe, just maybe, there are other things about me he finds more interesting. This is what must have made him everyone’s favorite teacher, umpire, adoptive grandfather—he acts as if there is nowhere else on earth he’d rather be than here, right now. And no one else on earth he’d rather be talking to. It is such a heady rush to be the object of someone’s attention in a good way, not as a freak, that I keep forgetting to hide. I know every detail he’s seeing. The pocked drawstring of skin flapping the corner of my left eye. The silver hatch marks cutting through my eyebrow. The puzzle-piece patchwork of grafted skin that doesn’t quite match and doesn’t quite fit. The way my mouth tugs upward, because of how my cheekbone healed. The bald notch at my scalp that no longer grows hair, that my bangs are brushed to carefully cover. The face of a monster. I cannot justify why I’ve picked Josef, a virtual stranger, to reveal myself to. Maybe because loneliness is a mirror, and recognizes itself. My hand falls away, letting the curtain of my hair cover my scars again. I just wish it were that easy to camouflage the ones inside me. The next morning on my way home from work, I drive by Adam’s house. I park on the street, roll down my window, and stare at the soccer nets stretched across the front yard, at the welcome mat, at the lime-green bike tipped over and sunning itself in the driveway. I imagine what it would be like to sit at the dining room table, to have Adam toss the salad as I serve the pasta. I wonder if the walls in the kitchen are yellow or white; if there is still a loaf of bread—probably store-bought, I think with mild judgment—sitting on the counter after someone has made French toast for breakfast. A moment later Grace stumbles out, coughing violently. “Cover your mouth,” her mother says. I realize I am holding my breath. Grace looks like Shannon, in miniature—same golden hair, same delicate features, even the same bounce to their walk. “Do I have to miss camp?” Grace asks miserably. “You do if you have bronchitis,” Shannon says, and then they both get into the car and peel out of the driveway. Adam hadn’t told me his daughter was sick. Then again, why would he? I don’t hold claim to that part of his life. As I pull away, I realize that I’m not going to book those airline tickets to Kansas City. I never will. Instead of driving home, though, I find myself looking up Josef ’s address on my iPhone. He lives at the end of a small cul-de-sac, and I am parked at the curb trying to concoct a reason that I might be dropping by when he knocks on the window of my car. “So it is you,” Josef says. He is holding the end of Eva’s leash. She dances around his feet in circles. “What brings you to my neighborhood?” he asks. His home is not decorated the way I would have expected. There are chintz couches with lace doilies on the backs, photographs on top of a dusty mantel, a collection of Hummel figurines on a shelf. The invisible fingerprints of a woman are everywhere. “You’re married,” I murmur. Josef becomes a regular at Our Daily Bread, showing up shortly before closing, so that we can spend a half hour chatting before he leaves for the night and I start my workday. When Josef shows up, Rocco yells to me in the kitchen, referring to him as “my boyfriend.” Mary brings him a cutting from the shrine—a daylily—and tells him how to plant it in his backyard. She starts assuming that even after she locks up, I will make sure Josef gets home. The dog biscuits I bake for Eva become a new staple of our menu. We talk about teachers that I had at the high school when Josef was still working there—Mr. Muchnick, whose toupee once went missing when he fell asleep proctoring an SAT test; Ms. Fiero, who would bring her toddler to school when her nanny got sick and would stick him in the computer lab to play Sesame Street games. We talk about a strudel recipe that his grandmother used to make. He tells me about Eva’s predecessor, a schnauzer named Willie, who used to mummify himself in toilet paper if you left the bathroom door open by accident. Josef admits that it is hard to fill all the hours he has, now that he isn’t working or volunteering regularly. And me: I find myself talking about things that I have long packed up, like a spinster’s hope chest. I tell Josef about the time my mother and I went shopping together, and she got stuck in a sundress too small for her, and we had to buy it just so that we could rip it off. I tell him how, for years after that, even uttering the word sundress made us both collapse with laughter. I tell him how my father would read the Seder every year in a Donald Duck voice, not out of irreverence, but because it made his little girls laugh. I tell him how, on our birthdays, my mother let us eat our favorite dessert for breakfast and how she could touch your forehead if you were feverish and guess your temperature, within two-tenths of a degree. I tell him how, when I was little and convinced a monster lived in my closet, my father slept for a month sitting upright against the slatted pocket doors so that the beast couldn’t break out in the middle of the night. I tell him how my mother taught me to make hospital corners on a bed; how my father taught me to spit a watermelon seed through my teeth. Each memory is like a paper flower stowed up a magician’s sleeve: invisible one moment and then so substantial and florid the next I cannot imagine how it stayed hidden all this time. And like those paper flowers, once they’ve been let loose in the world, the memories are impossible to tuck away again. I find myself canceling dates with Adam so that I can instead spend an hour at Josef ’s house, playing chess, before my eyelids droop and I have to drive back home and get some rest. He teaches me to control the center of the board. To not give up any pieces unless absolutely necessary, and how to assign arbitrary point values to each knight and bishop and rook and pawn so that I can make those decisions. As we play, Josef asks me questions. Was my mother a redhead, like me? Did my father ever miss the restaurant industry, once he went into industrial sales? Did either of them ever get a chance to taste some of my recipes? Even the answers that are hardest to give—like the fact that I never baked for either of them—don’t burn my tongue as badly as they would have a year or two ago. It turns out that sharing the past with someone is different from reliving it when you’re alone. It feels less like a wound, more like a poultice. “Everyone who’s a believer,” she qualifies. Shayla is born-again; this isn’t a surprise. But it still makes me uncomfortable, as if she is specifically talking about my ineligibility. The next day, Josef doesn’t come to the bakery. He doesn’t come the following day, either. I have reached the only viable conclusion: Josef is lying comatose in his bed. Or worse. A twenty-five-year-old disfigured girl and a nonagenarian? I suppose there have been stranger duos. I’m not sure if I’m crying because of the disaster in the kitchen or because I didn’t realize how upsetting it was to think that Josef might be taken away from me, when I’ve only just found him. I just don’t know how much more I can stand to lose. I wish I could bake for my mother: boules and pain au chocolat and brioche, piled high on her table in Heaven. I wish I could be the one to feed her. But I can’t. It’s like Josef said—no matter what we survivors like to tell ourselves about the afterlife, when someone dies, everything is over. That’s a fancy term for the holes inside bread. Artisanal bread is judged on its variegated crumb, other breads—like Wonder (which is barely even a bread, nutritionally) have uniform, tiny crumb. Then it becomes more clear: A beard. A thorny crown. The first visitors to our little miracle are the women who work in the shrine gift shop, who take a picture with the piece of bread between them. Then Father Dupree—the priest at the shrine—arrives. “Fascinating,” he says, peering over the edge of his bifocals. By now, the bread has grown stale. The half of the loaf that Mary hasn’t cut yet, of course, has a matching picture of Jesus. It strikes me that the thinner you cut the slices, the more incarnations of Jesus you would have. Rocco and I are watching this from a distance, leaning on the counter with our arms folded. “Good Lord,” I murmur. While she interviews Mary and Father Dupree, I hide behind Rocco, who rings up three baguettes, a hot chocolate, and a semolina loaf. Then Harriet sticks her microphone in my face. “Is this the baker?” she asks Mary. I take the Holy Stairs two at a time. Everyone comes to the shrine to see the giant rosary, but I like the little grotto at the top of the hill that Mary’s planted to look like a Monet painting. It’s an area nobody ever visits—which, of course, is exactly how I like it. “You believe in God?” I say, truly surprised. After our conversation about Heaven and Hell, I had assumed that he was an atheist, too. In the picture, I see a man, much younger than Josef—with the same widow’s peak, the same hooked nose, a ghosting of his features. He is dressed in the uniform of an SS guard, and he is smiling. 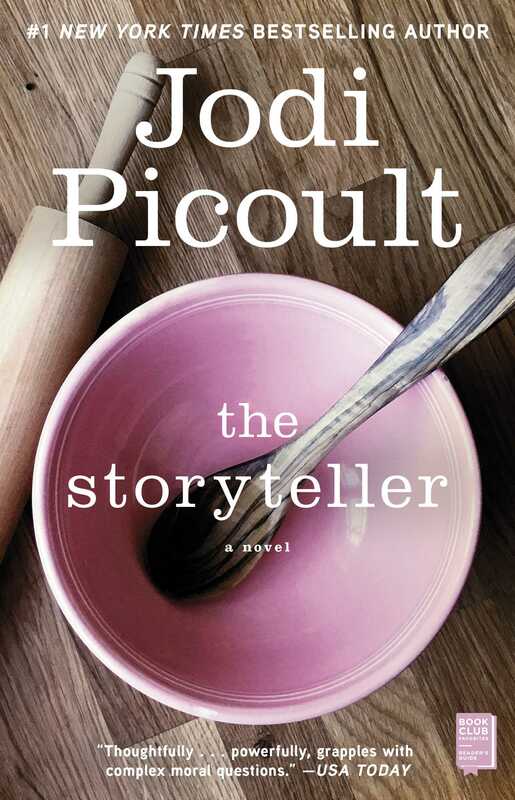 The Storyteller By Jodi Picoult Reading Group Discussion Guide This reading group guide for The Storyteller includes an introduction, discussion questions, and ideas for enhancing your book club. The suggested questions are intended to help your reading group find new and interesting angles and topics for your discussion. We hope that these ideas will enrich your conversation and increase your enjoyment of the book. When Sage Singer learns that the elderly widower she befriends in her grief group is a regular customer at Our Daily Bread, where she is the baker extraordinaire, it is not all that remarkable. In their tight-knit community of Westerbrook, New Hampshire, Josef Weber is widely known and beloved as the retired German teacher and a little league coach. But when Josef unexpectedly implores Sage to kill him, she could not be more surprised. Josef confesses to Sage his darkest secret: that he deserves to die at her hands because he was a member of the SS guard in Nazi Germany a lifetime ago, and because she is a Jew. As Sage considers Josef’s request, she reflects on the sacrifices made by her grandmother, Minka, a Holocaust survivor, and on the millions of other victims of the Nazi genocide. Confused, Sage seeks help from Leo Stein, a Justice Department attorney tasked with bringing war criminals to international tribunals. When Leo encourages Sage to connect the dots between her grandmother’s experiences at Auschwitz and those in Josef Weber’s story, she must first face her own moral failings and confront her own beliefs about the true meaning of justice. 1. In The Storyteller, Minka Singer’s fictional character, Ania, enjoys a special treat prepared by her father, the baker, just for her—a sweet pastry with cinnamon and chocolate that he fashions into a little puff. When Sage fashions a similar treat for her grandmother, Minka reveals that it tastes just as good as the ones her actual father used to bake for her. How does food connect families across generations? How does food retain memories? What are some of the special foods you enjoy that connect you back in time to relatives or the past? Members of your book group may want to bring their special foods to share at your next gathering. 2. When the Nazi soldiers force Minka’s family to leave their home and relocate to the Lodz ghetto, they give them just five minutes to clear out and take anything of value. If you were forced to evacuate your home in five minutes, would you know what items to bring with you and what to leave behind? What would be on your very short list of essentials? Your book group members may want to share what precious things they would choose to bring with them in such an unlikely event. 3. Josef Weber provides Sage Singer with a distinctly moral dilemma when he asks her to kill him to avenge the thousands of Jews who perished at his hands during the Holocaust. How, if at all, might the story be different if Mary DeAngelis, the owner of Our Daily Bread and a former nun, had received the same request? What roles do our personal attachments and beliefs play in the significant moral decisions we make every day? What are some of the philosophical, religious, and moral beliefs that you carry with you and that consciously or unconsciously inform your decision-making? How would you have responded to Josef Weber’s request? 4. Cook up a batch of Mink’s Rolls! 1. Butter a large non-reactive bowl for dough and set aside. 2. Butter a 12-cup muffin tin and set aside. 3. Pour warm milk into a small bowl. Sprinkle yeast and pinch of sugar over milk; let stand until foamy, about 5 minutes. 4. In a bowl, whisk together ¼ cup sugar, 1 egg, and 1 egg yolk. Add egg mixture to yeast mixture, and whisk to combine. 5. In the bowl of an electric mixer fitted with the paddle attachment, combine flour and salt. Add egg mixture, and beat on low speed until almost all the flour is incorporated. 6. Change to the dough hook. Add 3 tablespoons butter, and knead on low speed until flour mixture and butter are completely incorporated, about 10 minutes. Dough will be sticky. 7. Butter a large bowl. Place dough in bowl and cover with plastic wrap or a dish towel. Set aside in a warm place to rise until dough doubles in size, about 1 hour. 8. If dough is not in a warm area it may take longer to rise. A simple trick to help warm your dough – place a large pan of boiling water on the lowest rack in your oven and place bowl of dough on the next highest rack. This should help the dough rise. 9. Prepare filling: Place chocolate, remaining ¼ cup sugar, and cinnamon in a large bowl, and stir to combine. Add 3 tablespoons butter and toss to combine. Alternately, place chocolate, cinnamon and butter in food processor and pulse to combine. Set aside. 10. Once dough has doubled, turn onto a well-floured surface and deflate. Let dough rest for 5 minutes. 11. With rolling pin, roll dough into large rectangle shape. Sprinkle filling over dough; roll the dough into a log and slice into 2” pieces. Place each slice in muffin cup. Cover muffin tin with plastic and let sit for 15-20 minutes or until dough rises slightly. 12. Pre-heat oven to 350 degrees. 13. Bake for approximately 12-15 minutes. Remove from oven and cool on wire rack.